It's time for me to wrap up my Hunter Hayes' Pictures three-part music video film. 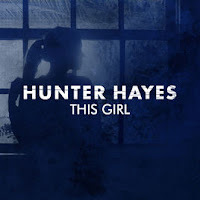 "This Girl" is the third part of this series of music videos, which has allowed Hunter Hayes to plunge us deep into a 60's narrative; this one concludes this Pictures collective, which all spanned from the "Rescue" music video as inspiration was drawn from the canvas paintings created in that visual. This wraps up the videos but leaves quite the open ending that has got us all intrigued. Watch Hunter Hayes perform this song in front of a house with his guitar, as we watch the character Sophie get married in this music video for "This Girl". Hunter Hayes, as you should know by now due to all my recent Hunter Hayes blog posts, is an American country singer who went viral with the release of the heart-melting song "Wanted". He's destined for success since he is beyond talented. He can play a multitude of instruments, which he has showcased throughout the years, but mainly in debut music video "Storm Warning". I adore his songs, most of which are ones that I can never get out of my head. These latest tracks don't quite hit the mark for me, although they are heartfelt, for sure. I am hoping his next album has one international hit, as he deserves to go global. This track was written by Andy Albert, Hunter Hayes, Jessie Jo Dillon, and Jordan M. Schmidt. Directed by John Edde & Matt Edde, this music video is the final part of the Pictures trilogy. It wraps up the character storylines that were previously in "You Should Be Loved" and "More". There is also a cast list, and within these music videos, you will see Olivia Evans, Sam Brooks, Wynn Reichart, Silva Riganelli, Jay Putnam, Allison Shrum, Michael Leidel, Percy Bell, Lacy Hartselle, and Sasha Asadourian. This last visual in the trilogy follows Sophie (played by Lacy Hartselle) as she gets ready for her wedding and thinks about the past, where her fiancé hurt her and where she fell in love with another guy, who she kissed at a party in the first music video, "You Should Be Loved". She battles with her emotions and her father comes to have a few words with her which are beyond adorable. Then, the guy, who she's fallen in love with, disrupts the wedding ceremony and she runs off with him. This is the perfect message - you should always follow your heart. As for the performance side of things, Hunter Hayes looks like he's hiding behind his guitar. He doesn't unleash his full potential that we've seen in other music videos. It makes us question whether his heart was in this song, and takes us back to "You Should Be Loved" where he's hiding behind the piano. It's a good performance, it's just missing the spark that he added in the "More" music video. The ending is confusing as we return to present day and we find out that Hunter Hayes is wrapped up in this storyline - maybe one of the characters is an ancestor of his? Could this allow him to continue these connecting music videos? Overall, this isn't as amazing as "More", it just has the same feel as "You Should Be Loved". It's still good, nonetheless, and we are interested in what Sophie is going to do as time goes on; but, you just have a feeling you know what's going to happen, and what we expected ends up playing out.